Home » Articles » Nadia Hamdi Triumphs Again! On April 5th 1997 the Nadia Hamdi encore tour started in New York. Once again, Nadia was presented in a two day workshop and concert by Morocco, her dear friend of more than twenty five years. Those of us fortunate enough to have seen Nadia live in Cairo were heartbroken when we heard that she had retired. 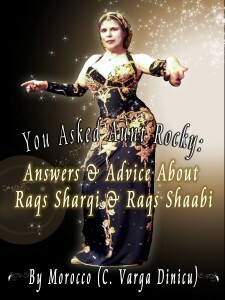 Lucky for us, Morocco convinced her she could still contribute to the dance world by teaching! She started by giving private lessons to dancers from the States and Europe (referred by Morocco) who wanted to study in Egypt. In 1995 Morocco organized a tour for her in the United States, including her friends and unindicted co-conspriators: Scheherezade of Richmond, VA, Sadira of Madison, WI, and Amina of San Francisco. Due to the success of her first workshops and concerts in 1995 and the amount of people who had to be turned away, Morocco immediately began making plans for a larger event. She added Zarefa Said of Gainesville, FL and Atira of Seattle, WA to the Nadia itinerary. For the 1997 NY workshops and concert, she rented a much larger studio in midtown New York and went to the the added expense of renting an 800 seat theater. Thanks to Moroccos years of experience and keen business sense, the weekend was a smashing success! Realizing that Nadia would be jet-lagged and her system would need time to adjust, she had her fly to New York four days before the weekend of the workshop. She did in fact become ill, but the four extra days gave her enough time to recuperate and she gave us 101% of herself both days of the seminar as well as the concert. The first day was totally sold out. 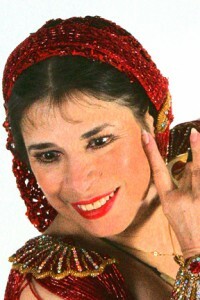 Nadia taught a vivacious Oriental routine to “Anna Ho” (“Im Here”), sung by Hassan il Asmar. It was bursting with a mischievous, joyful energy that was infectious, guaranteed to disarm even the most jaded audience. Morocco explained beforehand that Nadia taught by the Egyptian method, i.e. repeatedly doing the entire choreography with the class until it is learned. The routine consisted of basic movements arranged in a series of sections, which repeated in different sequences throughout the song. This gives the student the opportunity to continually see the “big picture” up front, making it far easier to assimilate those unique nuances that make a dance “authentic” and special. What stood out was that it showed a dancer doesnt have to use every step s/he ever learned in the first five minues of a dance to be entertaining, but that you can make a bigger impact by allowing yourself to have fun with the music and the audience. From the first step she took, Nadia radiated an aura of fun and playfulness that was so powerful, it drew you in like a magnet! The spirit of her dance style is real Egyptian, down to earth and funky. Its quite different from the “glamour puss” style popular in some parts of the U.S. today, which can often come across as pretentiously “seductive” and minimalist. Nadia loves interacting with the students as much as she loves the dance. She approaches each class with the anticipation of a five-year-old on Christmas morning. Her main concern was that her students left feeling they had received something valuable. Not only did she dance full out during class, but she also took extra time during her rest periods to break down movements and explain choreography. The show, which featured a full spectrum of Mideastern dance, from folkloric to fusion/interpretive, was a star-studded event. Our mistress of ceremonies was the ever-eloquent Sabah Nisan of New York, who set the perfect tone for the evening. The Casbah Dance Experience (Zanna Lanfrey, Nesrin, Varvara, Ajeeba, Leila and yours truly) opened the program with the Guedra, a trance ritual from the Moroccan Sahara, whose purpose is to spread love and blessings. It must have worked, because the atmosphere backstage was one of total repect, cooperation and friendship, regardless of the fact that we were all from different teachers, schools and artistic perspectives. It was an example of how successful we all can be, when we lay aside factionalism and pettiness, which too often separate us. A lot of us made acquaintances we wouldnt have, if this had been strictly a “Morocco camp” affair, but then again, Rocky has always been inclusive and ecumenical. Dorothea displayed her grace and dexterity in Raks al Assaya, an inspired cane dance dedicated to Morocco, with whom she took a cane dance workshop in Egypt. Shoshanna, Ayesha and Rayhanna of NYC, did a wonderful fusion number called Goddess Dance, conceptualized by Ayesha. Semerad of Albany New York was stunning in an elegant, green, two piece evening gown. She danced to a popular Egyptian song Ya Abu Had choreographed by yours truly, and I was very flattered to say the least! Katia, Sumaiya and Amera of the Near East Dance Company of Boston, did an inspiring choreography to one of my favorite songs: Al Anar. Habiba of Albany New York was dazzling in a multi-colored beladi dress, dancing to an updated version of Al Ain Mulayetein. The piece was a combination of the original melody, interspersed with cuts of House music. She never missed a beat, bridging the two musical styles perfectly. Nourhan Sharif of Rhode Island outdid herself in a theatrical version of the Zar, to Salamet Omu Hassan, choreographed by Shadia Malouf. It was a dramatic piece done in a white galabeya with red prints which looked as if they were made by blood stained palms. Comedic relief was provided by Katia, Izmira and Sumaiya of Near East Dance Theater of Boston , in Id Dars (“The Lesson”). In the skit, a young klutz is taught the correct way to dance by an Almee from the “Old School”. The Casbah Dance Experience, (including Morocco and myself) opened the second half of the program with an Upper Egyptian tableau, Fellah/Fellaha, done to a song by Metkal Kenawi, in which a young Saidi man tries to gain the attention of an unresponsive village girl. Fickle youth that he is, he soon forgets her when he notices her friends. Seeing him for what he is, they all reject his advances, leaving him in the dust. It was very much enjoyed by the audience, especially the Egyptians, who later said it reminded them of home and we finished to tumultuous applause. Gamila el Masri of NY was stunning in a cherry-red dress, doing Milaya Leff. Gamila took Nadias workshop, that included Milaya Leff in 1995. It was a beautiful dance, which she dedicated to Nadia. Dunya, well-known Sufi dance master, was absolutely mystifying in a Mideastern jazz fusion, Blue Perfume. Bathed in pale blue light and a white veil, she floated across the stage like a plume of smoke rising from a stick of incense. Morocco and I opened the Dance Orientale Suite with two solos and a duet to Bahlam Beek. We had the time of our lives and the audience must have liked it, because we could still hear the applause after we got back to our dressing room. Nadia Hamdi outdid herself in two numbers. First was her world famous Raks al Shamadan(candelabrum). Many in the audience had never seen this dance before. The sight of Nadia entering a dimmed stage in a halo of candlelight was mesmerizing. The audience was even more amazed at how effortlessly she balanced the shamadan, as she went through a series of splits and rolls, while playing finger cymbals. For the grande finale Nadia did her Oriental solo to Princess of Cairo. She wore a simple but elegant black and pearl costume with a matching cap embroidered with pearls. She thoroughly enchanted the audience, not only with her skill, but with the sense of humor joy and love which she radiates like sunshine. She finished to a standing ovation. It was a major high sharing the stage with so many wonderful and talented individuals, not to mention such a totally loving being as Nadia. Not only did the audience not throw vegetables, definite “Bravos” were heard! 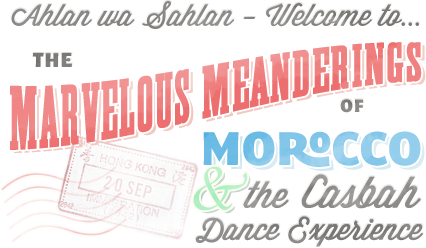 The concert was a success in another way as well: a significant portion of the audience had never seen Oriental dance before. It was a major step forward for our dance and all of us collectively, for them to have been exposed to so many different styles and excellent talented performers. The entire show was a class act from beginning to end. The next day we were all still high from the show. We were treated to a 2 hour Sufi workshop lead by Dunya, designed to help us relax and unwind. It was the perfect way to start the day! Nadia taught her Raks al Shamadan (candelabrum dance). The choreography looked simple when she did it, but now we had to do it. Even without a shamadan there were sections which were challenging, especially doing the undulations and hip articulations while laying on one side. : it definitely pays to have a little padding around the hips! As usual Nadia spent the break periods helping people, who she noticed having difficulty with a particular step, or who had questions. We got our moneys worth and more! Nadia is a wonderful inspiration. To Nadia, dancing comes from the heart. Its an expression of her spiritual path in life. As she explained to me, “Allah made me a dancer so that I could bring joy to peoples lives. An artists purpose in life is not to put themselves on a pedastal to be worshipped like gods”. If you have never had the opportunity to take a workshop with her, I suggest that you run, not walk, to sign up the next time shes in town. Special thanks must be given to Morocco, without whom this tour would never have taken place. Her attention to detail, professionalism and consideration made this the experience of a lifetime indeed.